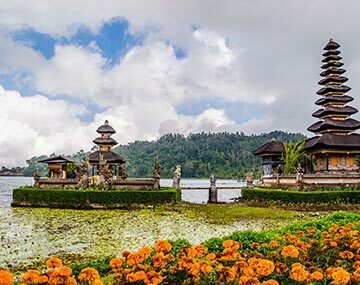 Start your journey to the magnificent island of Bali with the arrival at the Ngurah Rai International Airport where you will get a warm welcome by one of our representative who will assist you to the pre-booked hotel. Enjoy rest of the day at leisure activities with dinner and overnight stay at the hotel. On the 2nd day of your Bali tour enjoy your morning breakfast and then proceed towards Tanjung Benoa beach where you can enjoy the abundance of beach site activities like banana boat rides, sporting activities at the beach or just strolling on its powdery sand. In the afternoon enjoy scrumptious lunch at the Indian restaurant and then proceed towards Uluwatu Temple which is an ancient Hindu temple located on the top of the cliff offers spectacular views of a splash of the waves and stunning sunset. In the evening enjoy the performance of Kecak the most dramatic dance form of Bali which is also known as Monkey Dance. Return back to the hotel for dinner and overnight stay. Today morning after enjoying breakfast proceed to visit Bali Zoo Park one of its major attractions. Spreading over 8 hectares of lush tropical gardens in the village of Singapadu, Gianyar Regency is a home to a variety of species of exotic flora and fauna of the region. It offers the fantastic experience to its visitors like elephant or pony rides, photo sessions with animals, water sports activities etc. Enjoy your lunch at the local Indian restaurant at Ubud area and then continue your journey to visit major attractions of Ubud which is known as the centre for traditional crafts and dance like Goa Gajah Temple, Puri Lukisan Museum, Blanco Renaissance Museum etc. Return back to the hotel for dinner and overnight stay. On the 4th day after morning breakfast enjoy a tour to lembongan island, Bali with Bounty Cruise which departs from Benoa Harbour. The whole day cruise tour is full of fun-packed activities, water sports like snorkelling, canoeing, banana boat rides, glass bottom boat rides, village tour along with buffet lunch. After spending the whole day in the most scenic surroundings return back to the hotel for dinner and overnight stay. On the last day of your Bali cruise package after breakfast check-out from the hotel to board a flight for the return journey. Bali is one of the 17,000 islands in the Indonesian archipelago the mere mention of which evokes the images of paradise. Covered with sandy beaches, tropical rainforests, dramatic volcanoes, majestically beautiful temples, lip-smacking cuisines and joyful locals make it a haven to enjoy some of the memorable moments of your life. So avail our specially designed Bali cruise package that takes you to a memorable holiday trip. BookOtrip is a technology-based global travel Management Company that offers you world-class travel experience no matter where you want to go. We are passionate about travel and thus provide you travel solutions which are cost effective and offer you seamless journeys across the world. We offer you best deals on flight bookings, car rentals, cruises, hotel accommodations, travel insurance etc so that you can enjoy the best holiday trip of your life. I am a lover of seafood and going to Bali was my dream. Finally I visited Bali... Amazing view, food,clear sea etc. BookOtrip thank u so much for proving me the best services! !